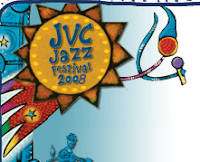 Yesterday I went to the 2008 Newport JVC Jazz Festival, and I figured I'd review it a bit here. We started off the morning with a set by the Mark Rapp band. Mark Rapp is a trumpet player, somewhat modern. He uses a wah about half of the time, and it's pretty cool. His band was good, too. The guitarist was a little over-the-top, but he was generally good, and the bassist was excellent. Oh, I almost forgot to mention, Rapp also played didgeridoo, which was cool. So, after Rapp, I saw a bit of Lionel Loueke, who was an excellent guitarist. Unfortunately, his band was not quite as excellent, and the first couple of songs ended up being a bit snooze-worthy, so I wandered over to another stage and watched George Wein and the Newport All-Stars (Howard Alden, Anat Cohen, Jimmy Cobb, and Eperanza Spalding. That was pretty good, although it was a little odd for all of those people to be playing together. Esperanza Spalding was especially good -- Wein had her do a solo bit (she's a bassist who also sings, which is a strange but nice combination). At 1:50, I went over to the Waterside stage for the "Newport Sunday Surprise", which turned out to be Bill Frisell! Considering that I was in the second row of a quite small tent, that was awesome (not that that was a surprise, or anything). After Frisell, there was a 20 minute break before Esperanza Spalding came to the Waterside stage, so I unwisely decided to get up and stretch. When I came back 5 minutes later, there were a few thousand people crowded into the area and I couldn't even get within 20 feet of the tent! So I watched a bit of her act from a distance, then went over to the Pavilion Stage to see Guillermo Klein Y Los Gauchos, a jazz band. They were a little raggedy, but they tightened up over their set, so it ended up okay. The last act I saw was Herbie Hancock, who was on the main stage. I was very unimpressed. For the first couple of songs, he had a trio of female backup singers whose voices seemed designed to bore into my head. When they weren't there, the guys on the mixing board just jammed the gain all of the way up on everything else, so it was actually painful to listen to, even from the middle of the field. Like, tooth-rattlingly loud. I'm sure Hancock was good, but I couldn't stand to try and listen to him. Such a shame. So, that was my Sunday. Pretty fun. Ciao.